Connecting with students from other countries can provide your learners with a rewarding opportunity to interact with people from other cultures and different backgrounds. Collaborating on a common project provides all participants with a common goal, that each group can contribute towards. Great projects provide all participants with opportunities to work towards addressing a global challenge, whilst bringing their own local knowledge and experiences to the task. iEarn welcomes a new collaborative math project, the STICK Project - Measuring the Circumference of the Earth. This project will connect secondary school students and the main objective is to measure the perimeter of the Earth, in a similar way to that used by Eratosthenes more than 2,200 years ago. For this, each group of students and their teachers around the world will measure the height and shadow of a stick during the solar midday of autumn or September equinox. This April, Join iEARN Moldova and global project participants in the Global Youth Service Day project. The project aims to support a global culture of engaged children and youth committed to a lifetime of meaningful service, learning, and leadership. The Global Youth Service Project will help teachers and students partner with local, state, national, and international organizations committed to engaging children and youth as leaders through volunteering, community service, service-learning, national service, and voting/civic engagement. 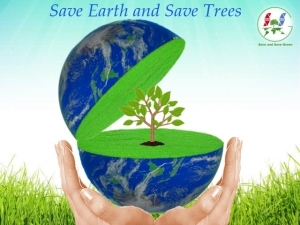 Celebrate Earth Day on April 22nd with the Every Day is Earth Day project! This year, classes are focusing on Ocean Pollution and Marine Waste Disposal. 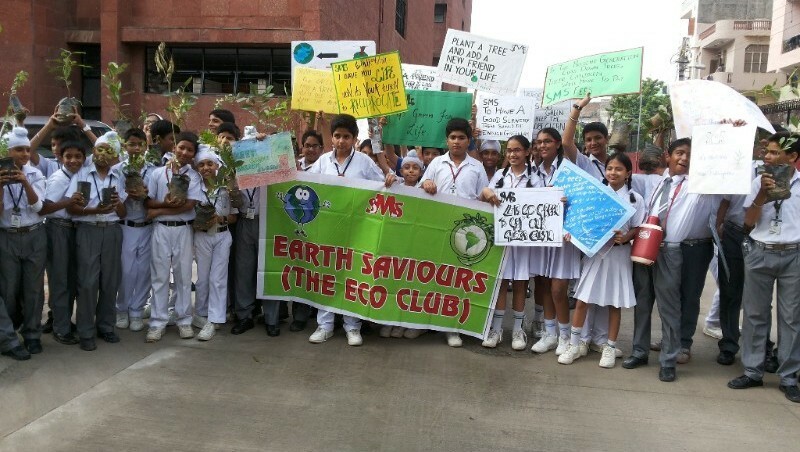 In the project, students write short essays or poems, take photos, create drawings, or make videos where they share their solutions to help protect the environment. SchoolNet's Hlengiwe Mfeka recently ran a workshop on Using in Digital Resources in the Classroom with teachers from twelve KwaNdgenezi schools, sponsored by the Rotary Club of Pinetown. Following the workshop, Hlengiwe visited each of the schools involved to observe lessons and to provide some additional support to teachers. Described below are some of the lessons that Hlengiwe observed. These lessons are good examples of how digital tools and content can be incorporated into lessons, even where there are not many resources available. 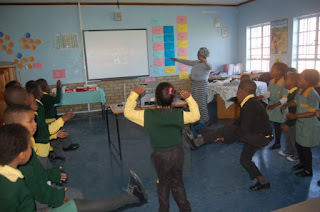 Mr. Sithembiso Mbokazi used a popular movie staring Jackie Chan as part of an IsiZulu lesson. Whilst the movie was in English, he used the film as a way to reinforce the different elements of a story such as plot, character, theme and setting. 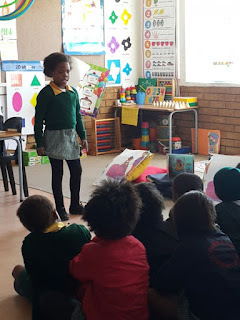 Once the learners understood the process of creating a story they were tasked with creating their own stories that incorporated elements of storytelling they had discussed in relation to the film. At Asiphephe Primary School Nosipho Bhengu introduced a life orientation lesson with a video on goal setting. 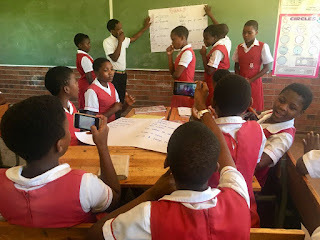 After watching the video, which introduced the concept of SMART goals, the learners collaborated to list their own goals. Not only will they remember all about goal setting from this lesson, they are also sure to use technology to access more resources to support lessons in their other subjects. At Wozamoyo High School the teachers set a task for an English lesson that involved learners doing a role play and peers taking a video. This video was then later edited so that it can be shown to others to raise awareness of appropriate cell phone use. The teachers at this school, Olga and Nana were not afraid to think out of the box to set a task that made use of the digital tools available. At Ziphathele High School, Geography teacher Sbonga was making good use of the resources on the hard drive provided by the Rotary Club of Pinetown to support his Geography lesson. For a subject like Geography, concepts are easier to understand and recall if one is able to see the place, land-form or climatological phenomenon being described. Digital resources allow learners to explore a range of places virtually that they may not get to experience in real life. We hope that the KwaNdgenezi teachers will continue to use the digital resources that they have been provided with, along as the skills they have acquired for integrating them into the classroom. With practice and experience it will become easier to integrate digital resources and to develop a wider range of engaging lessons. 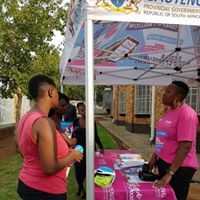 For the past two years Brescia House School has hosted a dinner for grade 11 girls who are studying either Computer Applications Technology or IT, their teachers and women in the IT industry. These dinners have provided a great opportunity for young woman with an interest in technology to network with professionals who have succeeded in the technology field. During the workshops, the girls and their teachers will learn more about Micro-bits, Robotics, Coding, Green Screen, Movie Making and more. The workshops will be followed by a three course dinner which will include two inspirational guest speakers. Changing seats between courses leads to the girls chatting to different professionals about what they do, which tertiary courses they found to be the most useful, and how they balance the demands of work and family life and working in a male dominated industry. If you are a high school technology teacher, please register for the workshop and dinner using this Quicket link. There is no cost for girls and teachers to attend the event however places are limited and registration is essential. If you are a female professional in the IT industry - we appeal to you to buy a ticket to attend this event using this Quicket link. You will have the option of purchasing a ticket for yourself to attend the dinner (R350), sponsoring a girl to attend the dinner (R250) or covering the costs of 5 girls and yourself to attend the dinner (R1 250). Not only will your contribution help cover the costs of the event, your stories and example may just provide a young girl with the inspiration to #MakeWhatsNext. See more about the CuriosITy dinner and workshops on the Brescia House School website. Ms Nozipho Mvubu is a new qualified teacher (ECD) teaching grade R at Bhongo Primary. She is passionate about her work, hardworking, calm and her heart is a hundred percent committed to what she does. She is creative, a critical thinker and organized – her classroom environment speaks for itself. The principal at Bhongo Primary highly commends Ms Mvubu’s positive attitude but mostly her humility. The principal mentioned how lucky she is to have Ms Mvubu as a teacher, noting that even parents prefer their children to enrol in her class having seen the impact on learner achievement under her care. "Give her any task, she’ll excel at it,” says the principal. The principal reported that after Ms Mvubu had attended the 'Using Digital Resources in the Classroom' professional development session she had given a moving presentation to all her colleagues on the staff sharing some of what she had learnt. It had not ended there; Ms Mvubu began to use the knowledge and skills from the course - and has not looked back. She continues to develop herself by searching the internet, continuously referring to the training materials provided. 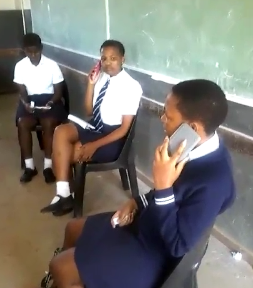 She brings her family’s old and new cell phones to school to be used by her learners. She has created a WhatsApp group for her the parents of her learners’ so that she can communicate with them and share learners artifacts and activities. It was impressive to see young children in grade R working confidently, efficiently and effectively with cell phones and a laptop and above all enjoying themselves yet learning! Well done to Ms Nozipho Mvubu. 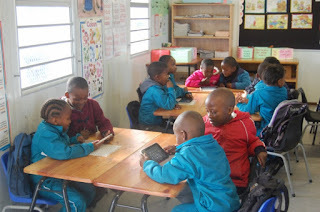 South Africa’s reading crisis – time for a digital and playful solution? There is a solution to the Foundation Phase reading crisis that the education system in South Africa currently faces. 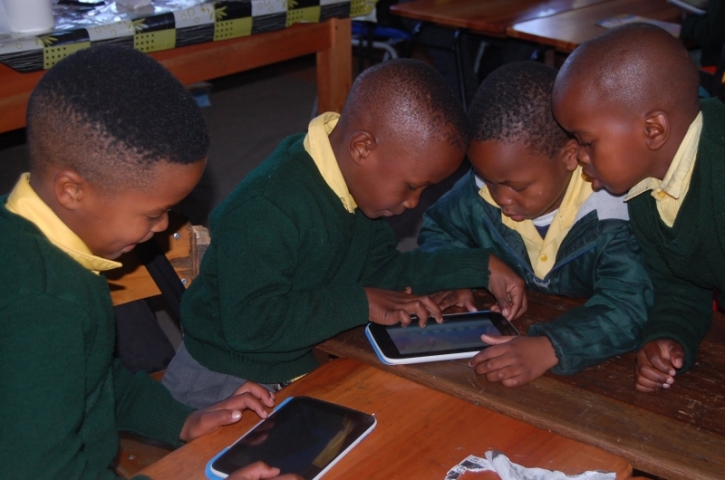 The early introduction and integration of digital tools in the classroom can and has proven to improve literacy levels amongst children, a SchoolNet South Africa (SNSA) study has found. The country’s reading crisis has once again come into the spotlight through the latest findings of the Progress In International Reading Literacy Study (PIRLS). It has revealed that many of country’s children are struggling to read; that as much as 78% of Grade 4 children cannot read for meaning in any language. While the research study of this project, called Learning Gains through Play (LGP), showed learning gains in all foundational literacies tracked, the most interesting findings were of gains in oral English language skills acquired subconsciously through play by second language learners. Ten schools in KwaZulu-Natal and the Western Cape each received a bank of learner tablets and an Xbox Kinect (including carefully selected apps and games) which, along with intensive teacher development and support, were integrated in teaching and learning activities in Grade R and Grade 1 classrooms. Learners were tracked over a four year period to assess their progress in foundational skills. Data was compared with control school learners who were assessed and tracked in the same manner (but did not enjoy the benefits of any of the LGP project inputs). Results showed improvements in achievement in all five foundational literacies of gross-motor skills, fine-motor skills, numeracy, visual literacy and oral English communication skills. This last literacy is of particular interest as the learning gains were substantial and furthermore, because the language of learning and teaching is a hotly debated topic in South Africa. With eleven official languages there is little consensus on which is more beneficial, for children to learn in their mother tongue or in the universal language of English. This issue is particularly contentious in the first grades of Foundation Phase in South Africa. 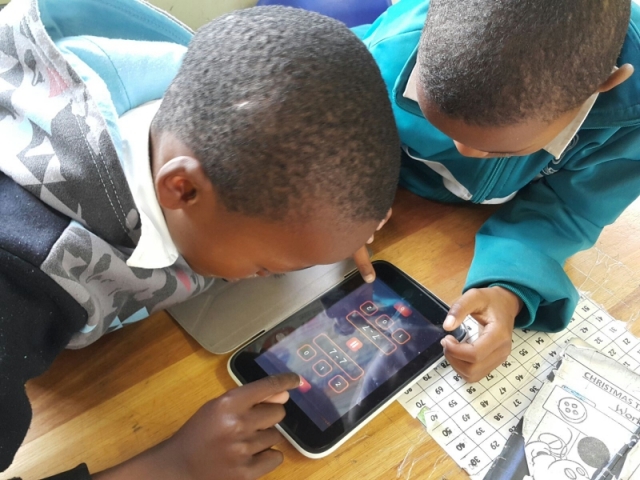 SchoolNet’s Learning Gains through Play project has shown that in the early grades, children can acquire English language skills “on their own” through engaging with learning games and apps that use English as the medium of instruction. This acquisition of English is very different to the formal learning of a language with its structures and rules. Acquisition is a subconscious immersive method to understand and make meaning, similar to the way in which babies learn their mother tongue. For the LGP children learning was mediated by their educators; it was not really learning “on their own” but learning driven by a need to make understanding of the games and apps in order to engage and entertain themselves with the digital tools that they found so exciting. One of the LGP findings was that learners’ curiosity was sufficiently enabled to trigger self-driven learning. The theory of second language acquisition (SLA) was proposed by linguistic professor Stephen Krashen (1981) and according to Krashen and Terrell (1995), students learning a second language move through five predictable stages: Preproduction, Early Production, Speech Emergence, Intermediate Fluency, and Advanced Fluency. 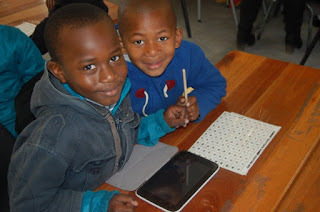 “With the majority of learners in South Africa learning in their home language in Foundation Phase and then making an abrupt switch to learning in English from Grade 4 (and this coupled with the addition of three more subjects), providing tablets, Xboxes, apps and games in English for learners in the early grades is an effective strategy for preparing learners for success in the Intermediate Phase and beyond,” says SNSA’s Executive Director, Janet Thomson. The worst hit from the reading crisis are poor and disadvantaged children, who make up 25% of the population who live in extreme poverty. An alarming fact is that learning deficiencies in the early grades accumulate and have a far greater detrimental impact in later grades and across all subjects including Mathematics. Only the top 16% of Grade 3 Maths students are achieving at the Grade 3 level (Spaull & Kotze, 2015). Clearly the vast majority of South African learners are not meeting the curriculum requirements even at the very start of their journey through the schooling system. In addition to the county’s poor reading culture, reading is also generally taught badly resulting in what the The Conversation has dubbed a “cognitive catastrophe”. The publication argued recently that “failing to learn to read is bad for the cognition necessary to function effectively in a modern society.” This essentially means that we are raising generations of cognitively stunted individuals who then become stuck in intergeneration poverty. One of the reasons why the PIRLS Study tested 13 000 Grade 4 children is because it is in the Foundation Phase “that the base for all future learning is established, and if the rudiments of reading, writing and calculating are not firmly entrenched by the end of Grade 3, then both learning opportunities and the larger life chances of young citizens will be curtailed” (National Education, Evaluation and Development Unit, 2013). 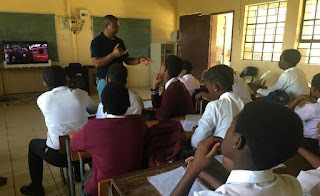 Many South African teachers have joined the Microsoft Educator Community to complete online professional development courses, to be part of a global community of teachers, to participate in Skype in the Classroom activities and to share lesson plans and quick tip videos with teachers from around the world. As of 12 March 2018 new users will only be able to join the Microsoft Educator Community using either a personal Microsoft account or an Office 365 account. According to Sonja Delafosse - Microsoft Senior Education Manager, "We’re phasing out accounts so we can optimize user experiences with Office 365 and Microsoft personal accounts". Teachers who have already joined the Microsoft Educator Community using a Facebook, Skype or Twitter account need to change their login details to reflect either an Office 365 or Microsoft personal account by 8 May, 2018. After 8 May 2018 Microsoft Educator Community users who are currently accessing their accounts through Facebook, Skype or Twitter email addresses will lose access to their account and badges, certifications and any published content will be permanently deleted. Don't lose the badges, certificates, points and connections you have worked so hard to achieve. Log in to the Microsoft Educator Community now to convert your login details to a Microsoft account. #thintimillion is a cloud-based learner management system which Microsoft has made available to scale access to key digital skills training modules. 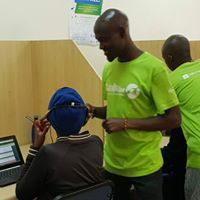 Young people who have never used a computer will be trained on Microsoft Word, Excel and PowerPoint and will be able to complete online tests and assessments. Young job seekers can access the training materials at libraries and training sites throughout Gauteng or they can complete the modules on their phones. 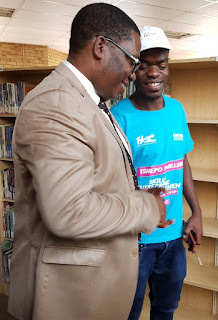 The Thinti'Million Digital Literacy - Productivity Programme launch event took place at the Sebokeng Library on 4 April 2018. At the event Gauteng MEC for Education Panyaza Lesufi stressed that "youth need a hand up; not a hand out". Young people in attendance were already hard at work navigating through the modules and taking the online quizzes with many saying that they would be back to continue the course. Teachers can encourage learners to complete the online courses so that they develop basic digital skills whilst still at school - ensuring that they are better prepared for tertiary studies or the workplace. As Microsoft SA says: "It is critical that we enable all citizens to effectively participate by building the necessary digital skills and bridging the divide. #thintimillion @Tshepo1Million"